sOMEThING - Warning: This Yo-Yo May Be Habit Forming! sOMEThING treats every piece of each yo-yo they design with equal importance to give you the best possible finished product. The injection molded plastic body is fitted with precision machined aluminum weight rings to guarantee a stable spin - But sOMEThING didn't stop there, they even custom machined the nut and bolt on the addiction to give you the smoothest spin possible! And did we mention it looks fantastic? The translucent plastic with raw engraved aluminum accents give the Addiction a really simple yet refined and beautiful look. 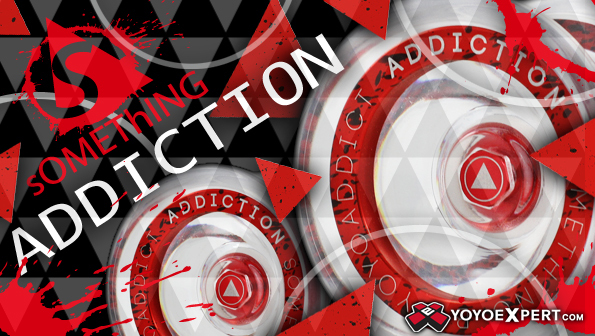 Just throw it once and you will see why they named this yo-yo Addiction - once you pick it up you are going to have a hard time putting it down!